To get good results using chisels when woodworking it's important to keep them very sharp. 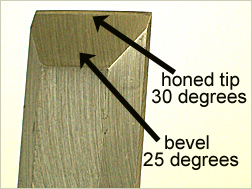 If you look at a chisel in profile you will see a large bevel which is at an angle of around 25 degrees, with the very tip "honed" to around 30degrees. For best results re-hone the chisel every time before using. You'll need a chisel sharpening stone. Pour a little oil onto it to lubricate. For best results use a honing guide(approx. £6) which is a handy little tool that clamps onto the chisel and holds it at the perfect angle. 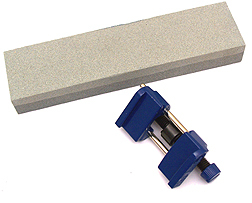 Draw the chisel over the stone. When done remove it from the guide, then finally turn it on it's flat side and gently rub it on the stone to remove any burrs that have formed during honing. Now its razor sharp and ready to use. If your chisel has been really misused and you have taken great lumps out of it you'll need to use an electric grinder to re grind the bevel until the leading edge is smooth and sharp again. Then hone it as above.